There are times when some things in the house are no longer used. It is because they are damaged or rusty or are no longer functional or you have new ones to replace them. But did you know that you can still use all your old stuff? 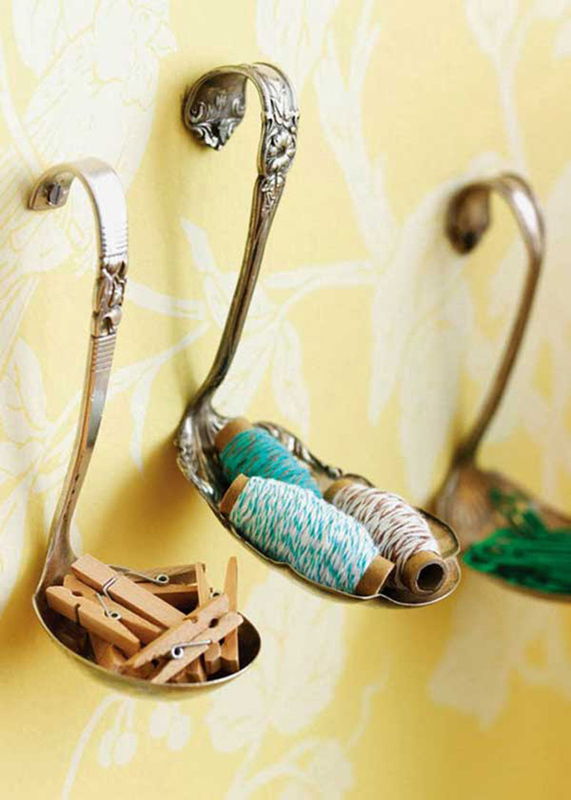 For instance in the kitchen, you can turn old spoons into hooks instead of throwing them away. And yes, you can make so many things from old kitchen items and that is what we are going to share to you today. 1. Guess you have seen this before. Bend Spoon Handles and install it on the wall. Pretty awesome! 2. I think you will find this one cute. 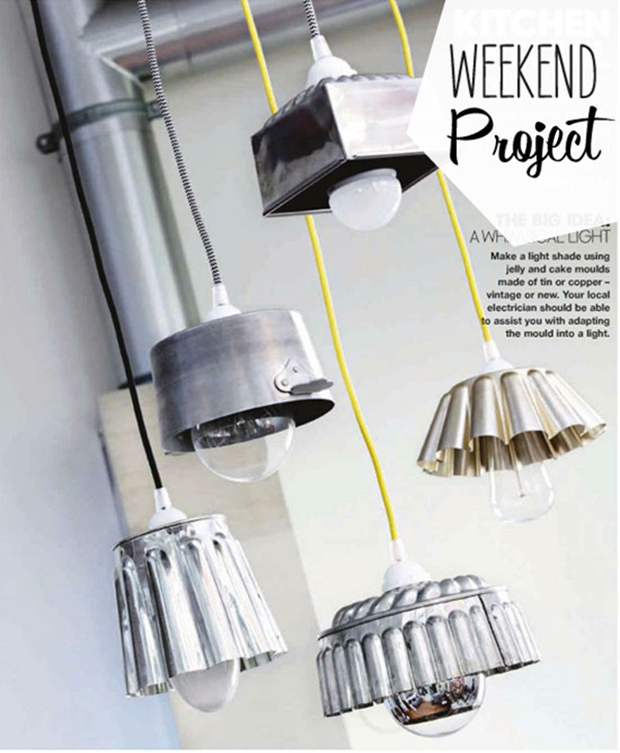 A Jelly and Cake Mold Lighting for the home! 3. Want something to hold your photo frames? Easy. 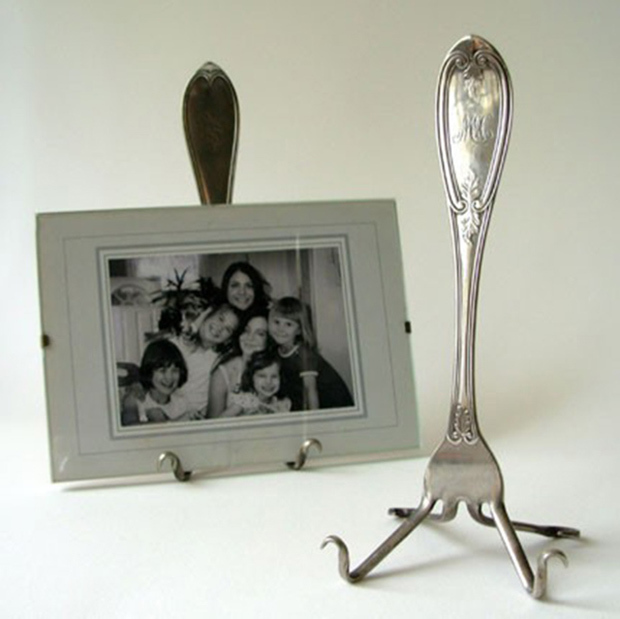 Use a Recycled antique monogrammed silver-plated Fork Easel like this. 4. 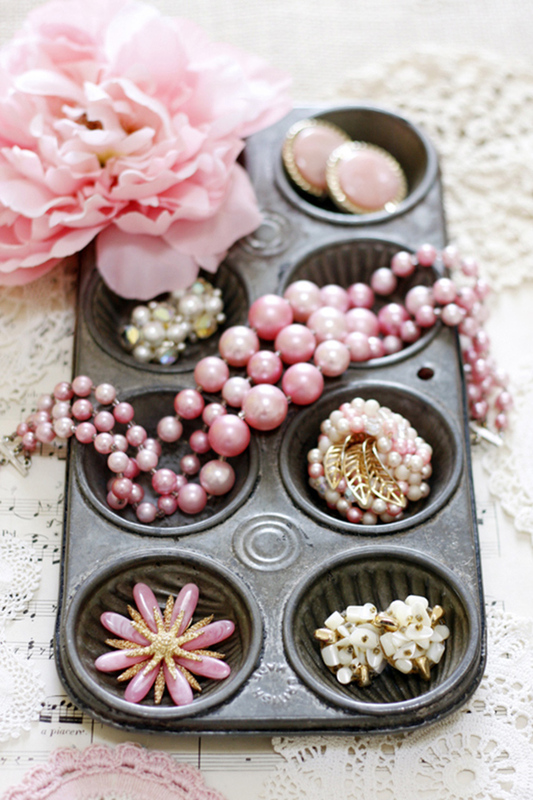 Muffin Tins aren’t just for the oven but they can also be cute jewelry organizers too! 5. Want to place your eggs in your table? 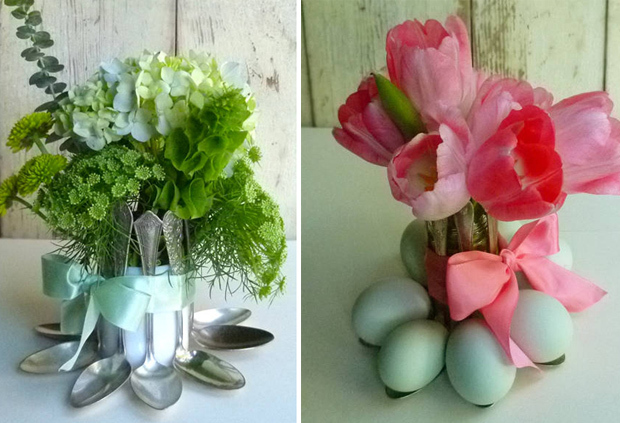 Make this simple and pretty Spoon Egg Holder! 6. 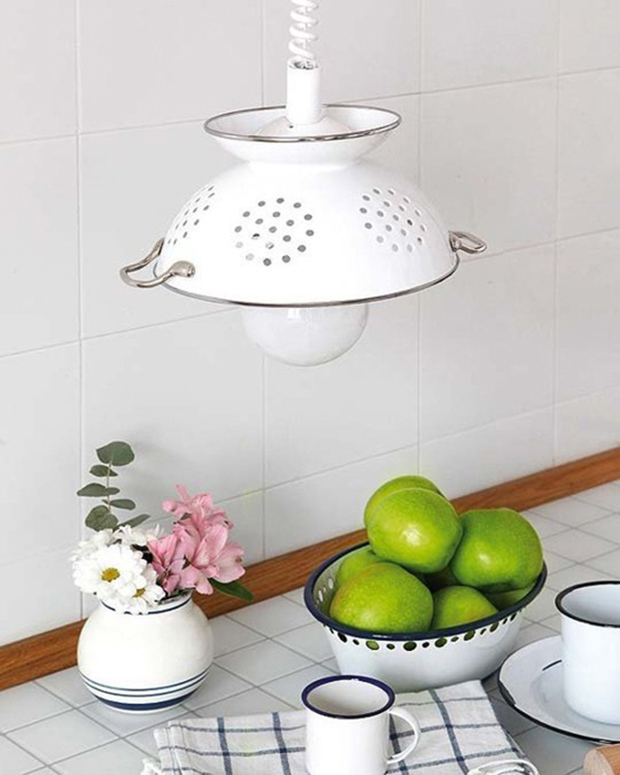 If you are not using your colander, then make a Colander Pendant Lamp! Your kitchen will never be boring for sure! 7. 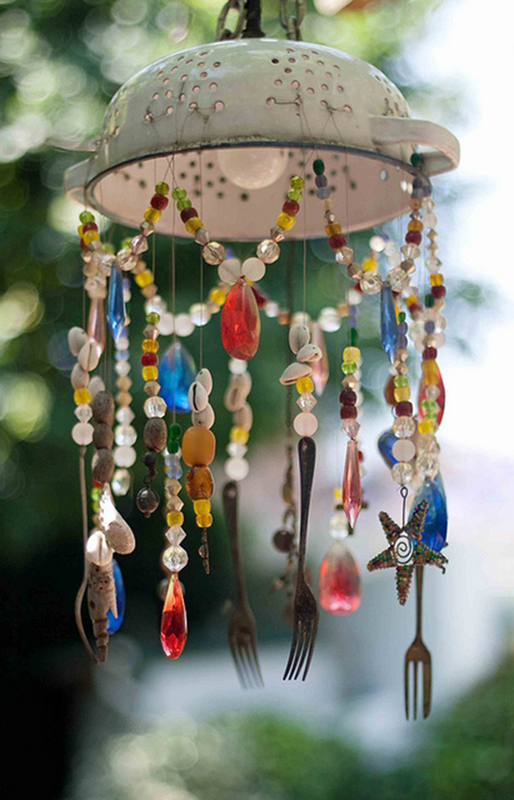 This Kitchen Items Repurposed Chandelier is so very cute with all the beads in it! 8. 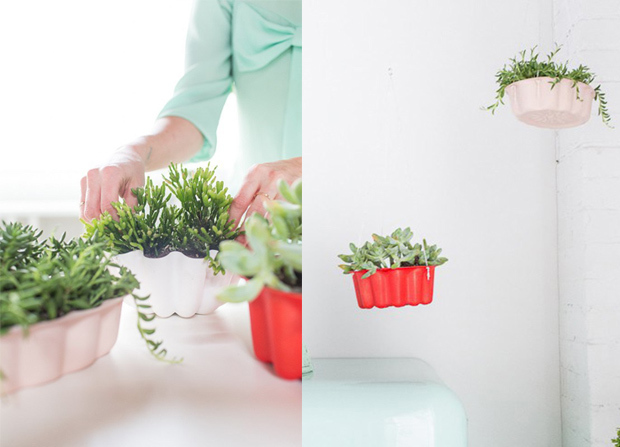 These Cake Pan Planters look really great especially when painted in different colors. 9. 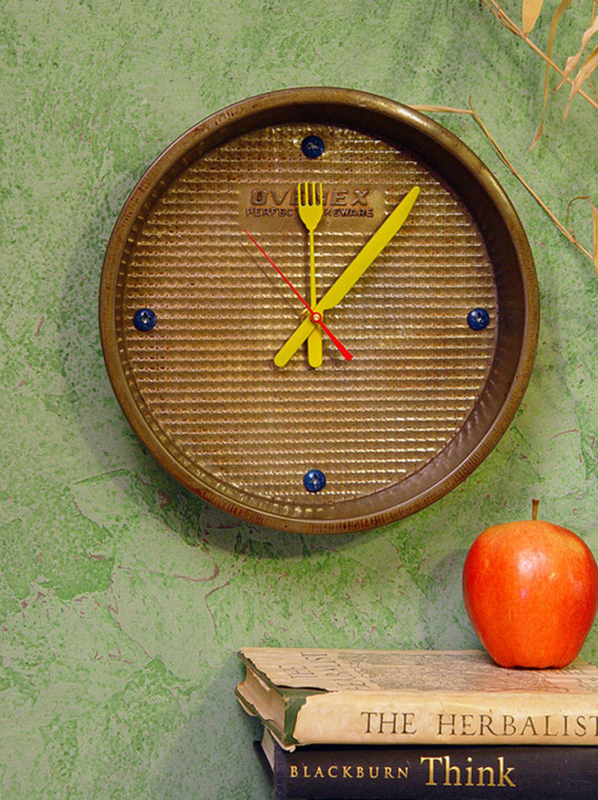 You can also turn your pans into a sweet Dessert Pan Clock!. 10. 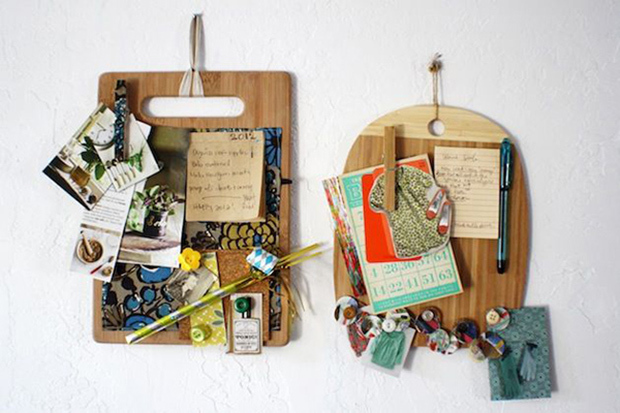 It would look very creative to use cutting boards as organizers as if it was a clipboard! 11. 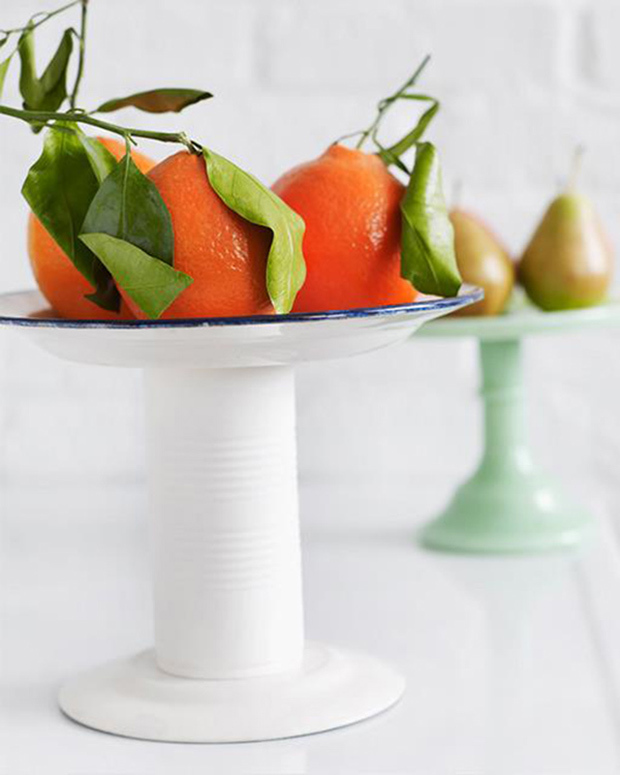 Add some interesting appeal to your buffet table with a pedestal stand using plates and tin cans! 12. Got some old graters? 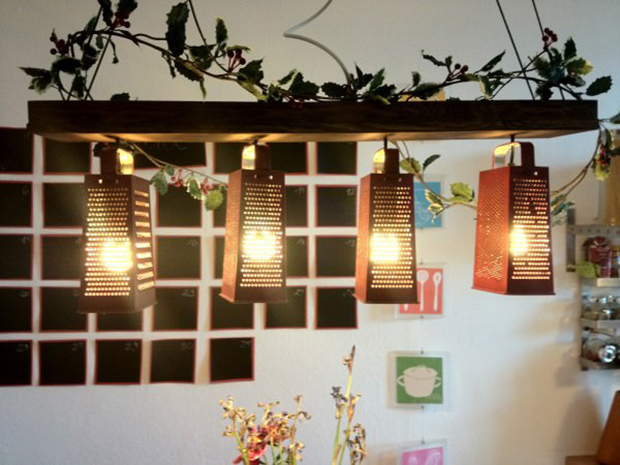 Make a recycled graters lamp by hanging them from wood and of course, add some lights! 13. 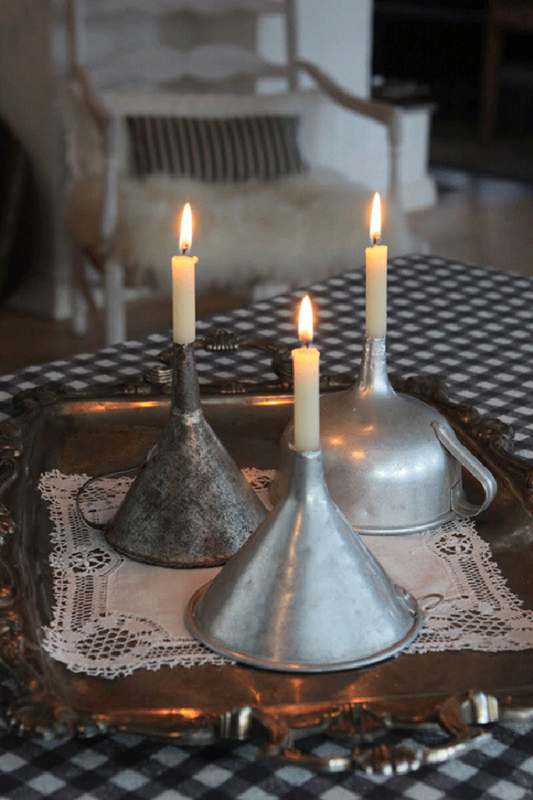 I like the vintage appeal of these funnel candlestick holders. Lovely, right? 14. 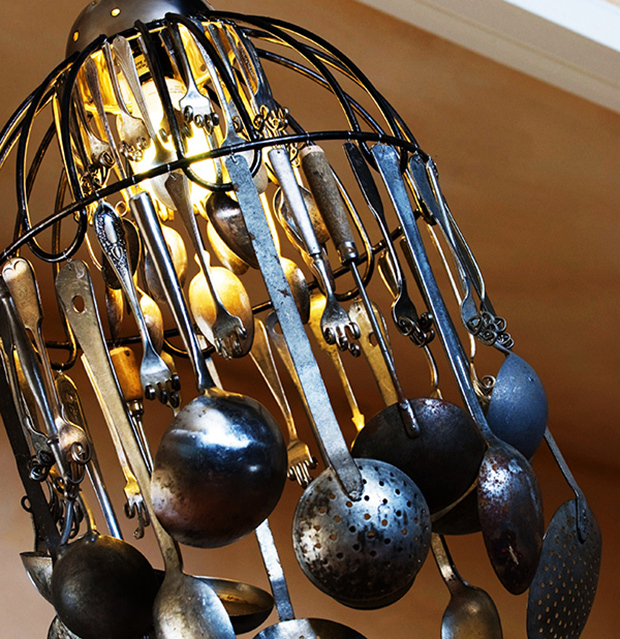 You can express your creativity with this Flatwear chandelier made from forks, spoons, ladles and others. 15. 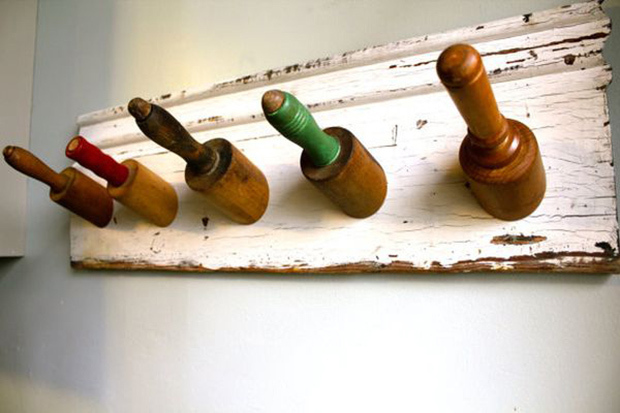 Make use of old rolling pins in the house. Simply measure and cut the rolling pins all the same size and attach them to a piece of wood. Now you have your own rolling pin hook! 16. 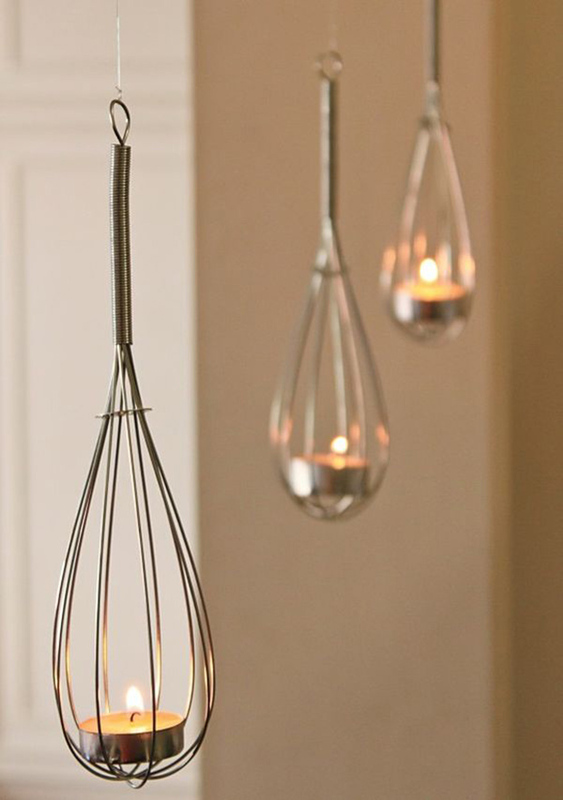 I find this whisk candle holder very cute! I know you do too! 17. So adorable! 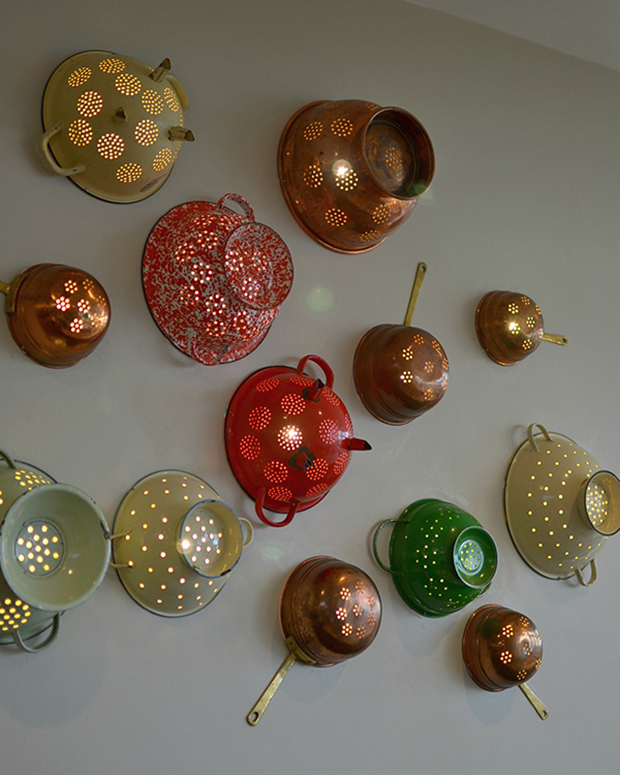 Add some life to your walls with this colander wall lights! 18. 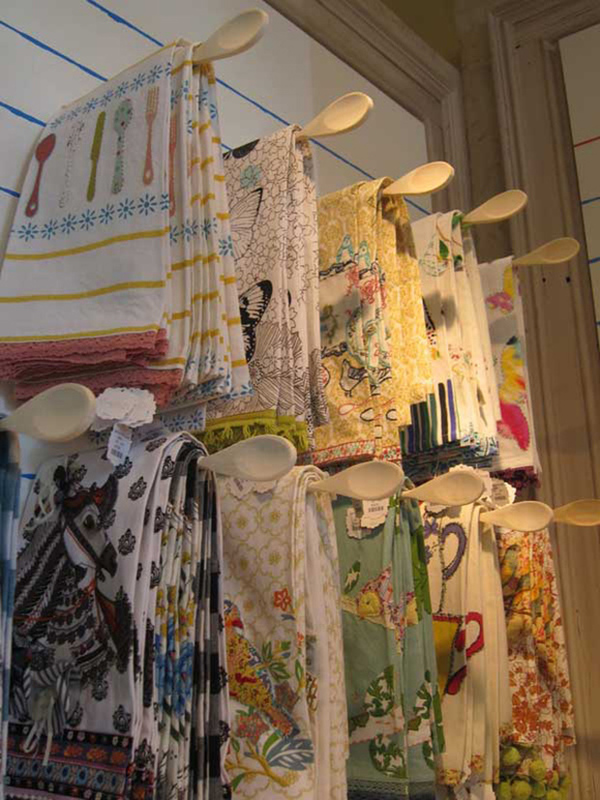 Your wooden spoons would also look very pretty as a towel rack! 19. 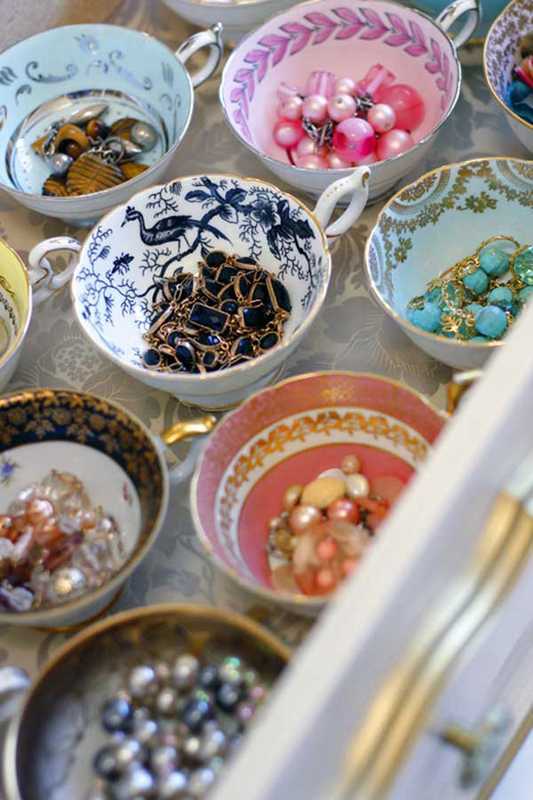 Gather some pretty cups that are no longer used in the kitchen and make your own tea cup jewelry storage. 20. 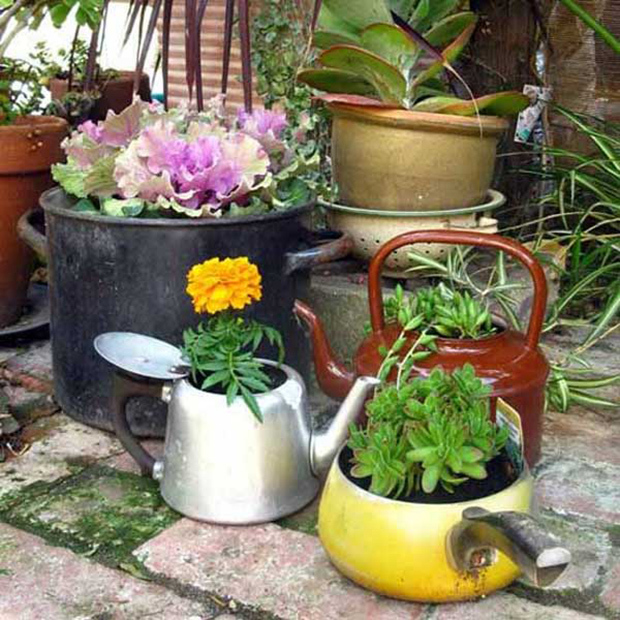 Instead of throwing old kettles, make use of them in the garden as a kettle planter. 21. 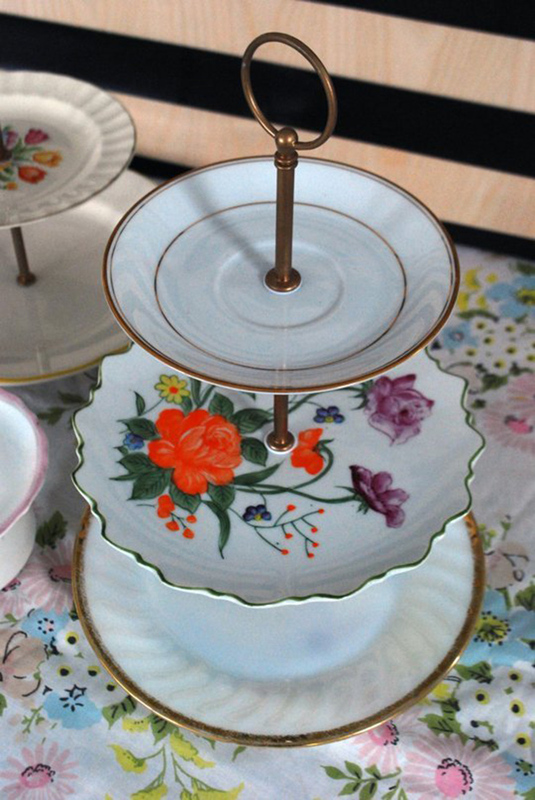 Make your own vintage plate tiered dessert stand! It is so easy to create! 22. Love birds? 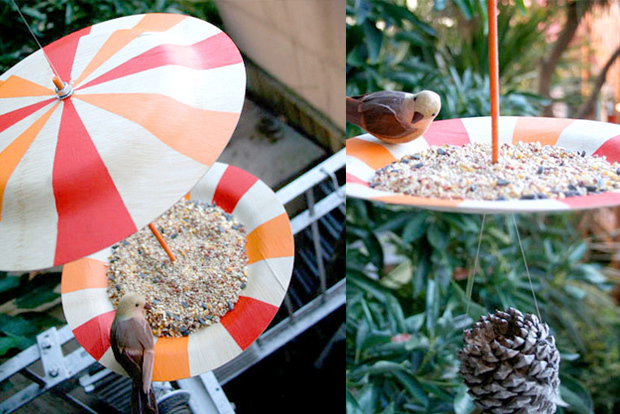 There are different ways to make a bird feeder and one is to make use of a plate so you can have a bird feeder plate. 23. 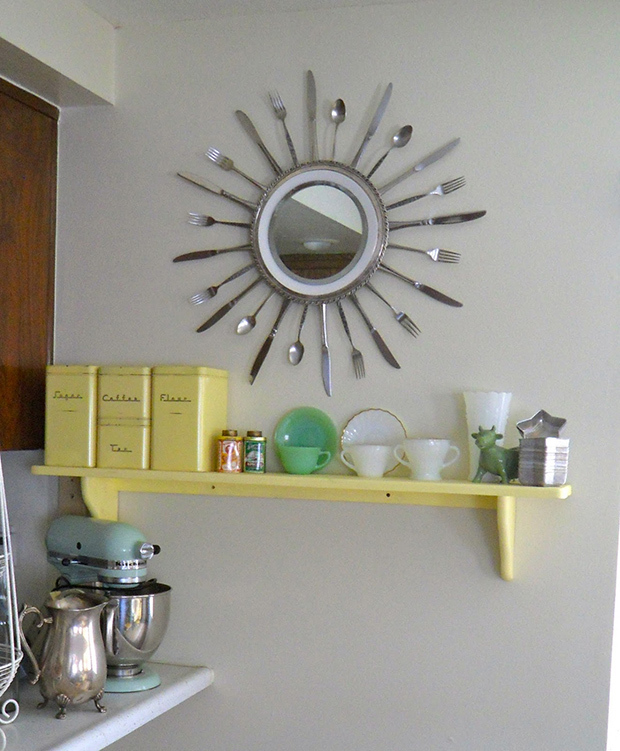 Decorate your kitchen with this pretty sunburst mirror made from kitchen utensils. 24. 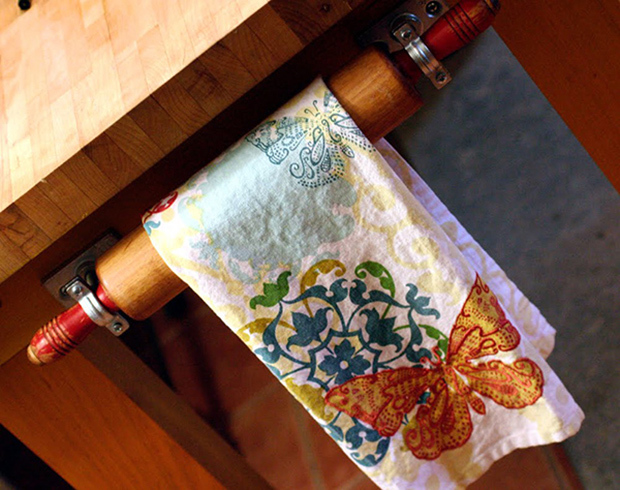 Use an old rolling pin as a towel rack for a gorgeous vintage touch. 25. Get an old cheese grater and paint it. 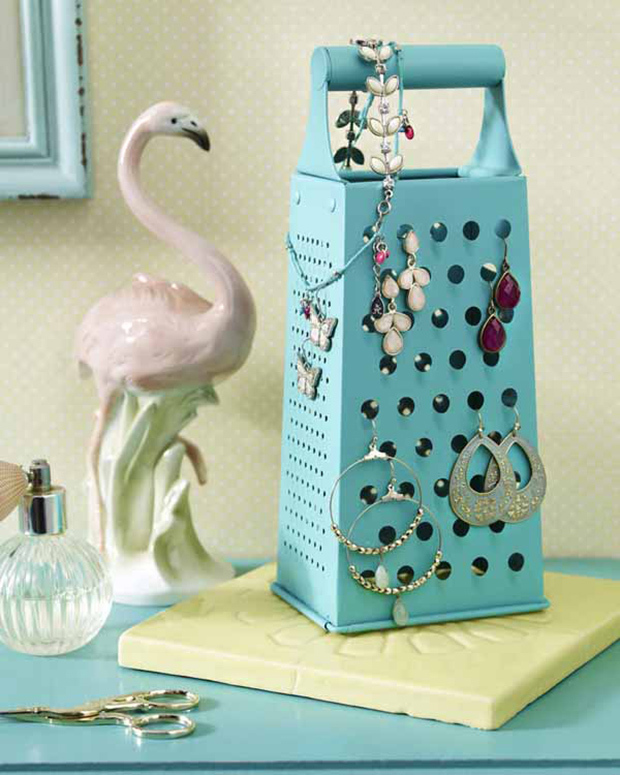 Then use it as an earrings organizer! 26. 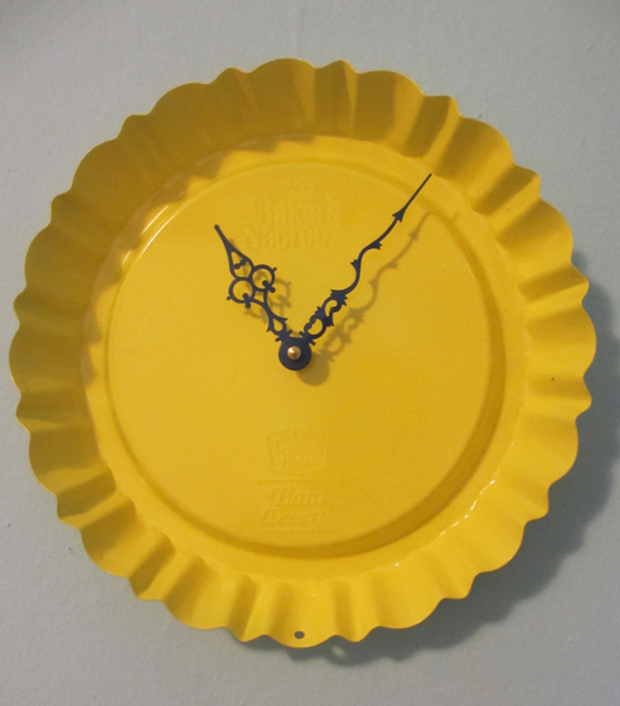 Create a Kitchen Wall Clock with knife & fork hands! This looks very nice. Guess the hard part will be in drilling holes for the clock arms. 27. 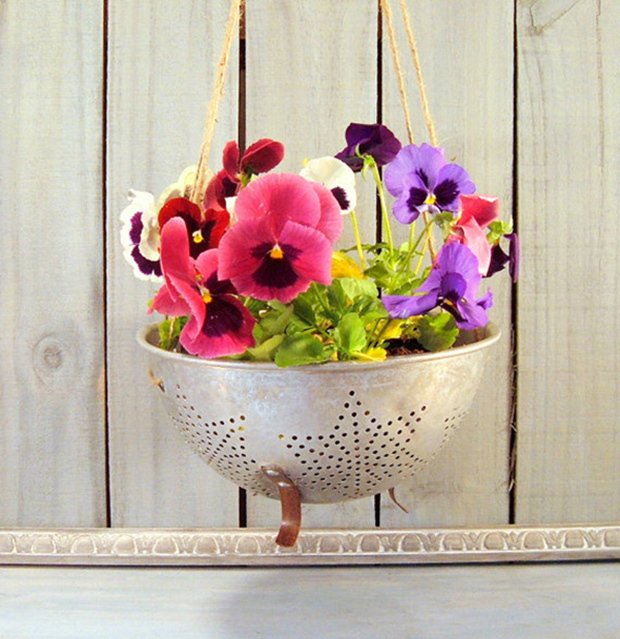 You can also make a Colander Flower Pot if you no longer use the ones you own. 28. 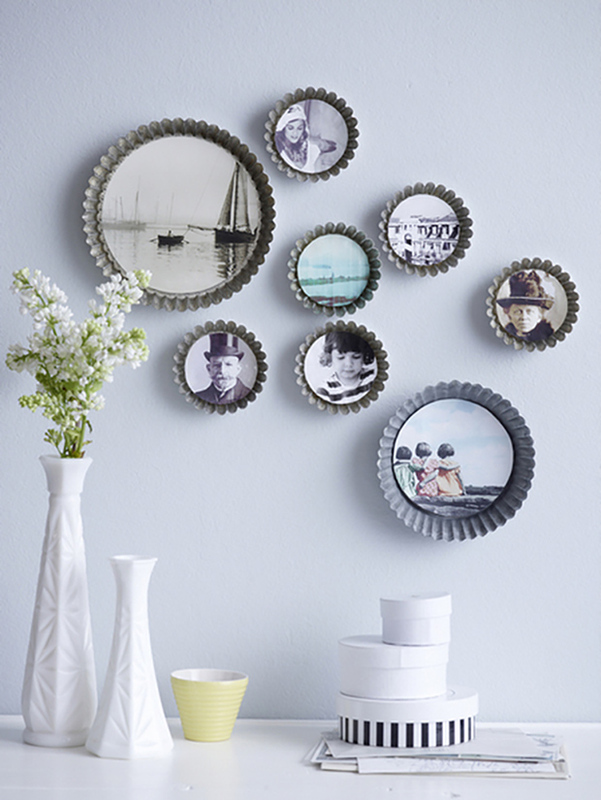 Add interesting wall decors with cake pans. You can either leave the metal as is or spray paint them in different colors. This cake pan wall frames looks really creative! 29. Cut old big bottles and turn them intolamps shades! 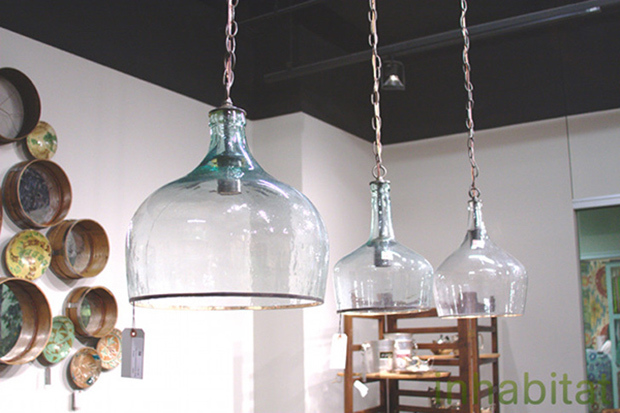 A nice way to repurpose glass bottles! 30. This one looks extremely cute and creative! 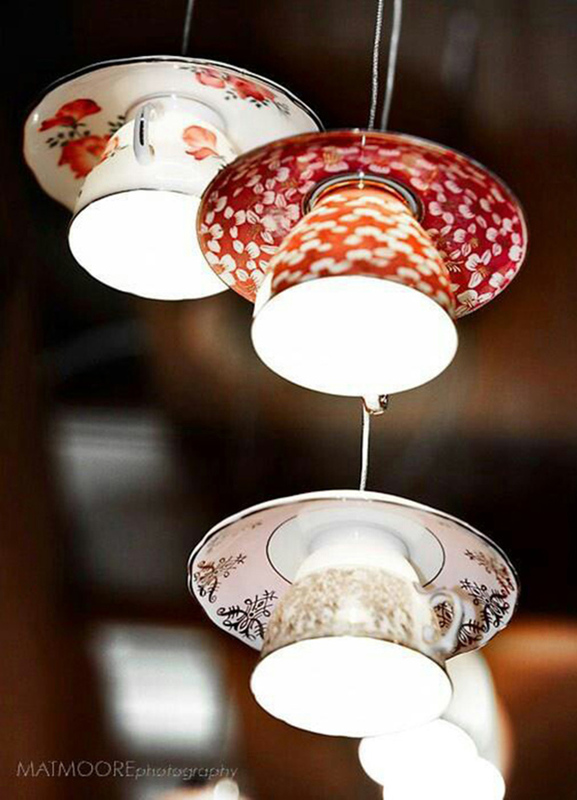 It will give some Alice in the Wonderland feel in your home with teacup lights! So, after seeing this list, you will surely keep your unused kitchen items so you can turn them into something else with a different function! It would surely be fun making all these and also, it would be exciting to be able to create something new from old items. Which of the above items would you like to try making? Share this to your friends so they can create some re-purposed kitchen stuff too!